Millhouse Manastorm has always been one of those cards that exist to teach players that a card's rarity does not always dictate its playability. It's always been the card that you craft a golden copy of only when you lose a bet on /r/hearthstone. But in 2018, is it really that bad? Late in the season that just passed, Millhouse Manastorm saw a 10x increase in play-rate. This was likely on the back of Thijs piloting a version of OTK Paladin to Rank 2 legend which incorporated the card. The intended method of bringing Millhouse into play is via a summon from Call to Arms, a class defining Paladin spell introduced in Kobolds and Catacombs. By summoning him in this way, you get all the stats with none of the downside which is a pretty good deal! As good as that sounds, this article isn't about when things goes right. So what can you reasonably expect to happen if you play Millhouse on curve? Despite the card existing since the game's inception, how many of you have actually summoned up enough courage to try this? Some of you clearly have, and the graph below shows what happened. What's apparent immediately is that it's probably not a good idea to play an on-curve Millhouse against Druid or Mage. Both of these classes can run big spells, and you're likely to give your opponent over 10 mana worth of free spells. Cards like Ultimate Infestation and Nourish allow for big draws and chaining of spells which can really ruin your day against Druid in particular. The next tier down is Priest and Hunter, where you're likely to give 6-7 mana on average. Spell Hunter has led to Hunter in some cases having vast arrays of spells in the early game, and allowing all of them to be played at once probably isn't a great idea. The popularity of Spiteful Priest has led to the resurgence of cards like Mind Control, which are obviously pretty good when they cost 0. Finally, you're likely to concede less then 5 mana to the other 5 classes. 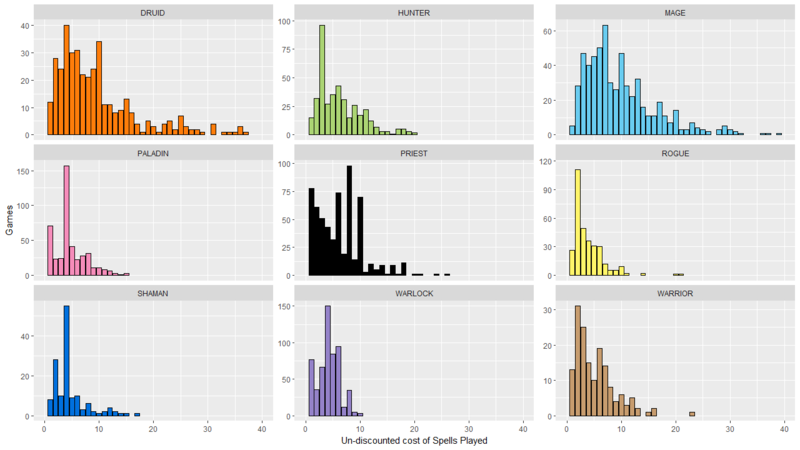 Warlock seems to be the least able to take advantage of this discount since most of the spells it typically runs are reactive or defensive. An interesting insight given the prevalence of the class in the current meta. Sometimes its fun to watch it all go wrong. The following represents the absolute worse case scenarios we have seen across the 1000s of on-curve Millhouse YOLOs we've recorded over the last expansion cycle. 44 mana worth of spells facilitated by 2x UIs. It's hard not to admire this guys courage. A fully upgraded Emerald Spellstone is a pretty strong play on turn 5. Needless to say, it's a decent play on turn 2 also. Complete your quest on turn 2? Well, it can happen. I'll bet when you mulligan 2x Level Up and a Stand Against Darkness in your Aggro Dude Paladin deck, you think your going to have a bad time. Needless to say its a pretty short replay. When you mulligan all your Big Spells in your Spiteful Priest deck, you're usually pretty salty. Not this time. There's nothing like a classic double Millhouse featuring Vanish and Sprint (in all fairness who would expect Sprint in Rogue in 2018). Unstable Evolution. This guy was just showing off in the end. This one isn't a turn 2 play, but it does have 2x completions of the The Final Seal because you REALLY want to be sure you opponent's deck isn't coming back. Warrior has some big spells too, and probably the only time ever a Lotus Illusionist went off. Millhouse is one of those awesome cards in Hearthstone that tempt the player with a premium offering, which comes with a significant counter-cost that forces the player to really think about how it might be played. It's also got serious meme potential, and it's generated many highlights over the lifetime of the game. It's a card that makes you think, but also generates spectacular moments. So next time you lose an argument and are forced to craft a golden copy, why not give it a go?